If you love the scottish fold cat, then you probably have heard the story of their humble beginnings. How, in 1961, on a small farm in Perthshire, Scotland a shepherd named William Ross discovered Susie, the first known Scottish Fold. That year was the beginning of a wonderful era for the Cat Fancy. That is the year the Scottish Fold started on it's journey to the wonderful cat we know and love today! Mr. Ross noticed that Susie had small "caplike" ears that folded over giving her an "owl like" expression. 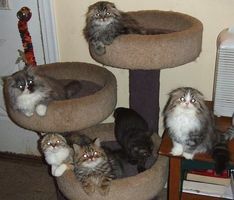 He asked to have a kitten from her and with the help of geneticist Pat Turner, he started breeding scottish folds, first registering them with GCCF in 1966. By the time the Fold was granted Championship status with CFA (Cat Fanciers Association) in 1978, many Americans were already taken with these wonderful cats. here's another story, one that I like much better. You may have heard the ditty about "The Owl and The Pussycat". Well there are some who say that the Fold is the product of that strange and wonderful encounter and who can blame people for thinking that.. After all, you only have to look at that wonderfully round head and those BIG expressive eyes and you can see where maybe Fantasy and Reality have come together. No matter where they came from, the Scottish fold is truly one of the most incredible and loving animals you'll ever come across. Once you've owned one of these incredible cats, you'll never want to be owned by anything else.